Getting a rental car in Thailand can be a convenient way to explore the country. Though driving in any foreign place takes a little getting used to, once you get out of Bangkok, Thailand is actually a really pleasant place to drive. Highways are well maintained and serve most of the country, and road customs are not too difficult to understand. Watch out in Bangkok, or any big city, as traffic and tailgating can be horrible, and road rules are probably much different than you're used to. Budget and Avis both operate in Thailand and have offices in the airport and most common tourist areas. There are also local car rental agencies as well. Make sure you check your personal car insurance and credit card insurance to see whether you will be covered for any accidents or damage that could happen if driving in another country. In most cases, you do not need a special driver's license. If you are in the country for less than six months, you may drive with your home driver's license. If you are in Thailand for more than six months, you should either have an international driver's license (available through AAA) or a Thai license. In Thailand, you drive on the left side of the street and the driver's seat is on the right. So, if you're coming from the UK you won't have any trouble acclimating. If you're visiting from the U.S. or another country where people drive on the right, initially this may feel awkward. Out on the road, there are some differences in driving etiquette that you should be aware of before you get behind the wheel in Thailand. Tailgating and cutting each other off is much more common and somewhat acceptable. Many shops, malls, restaurants, and hotels offer parking, and it is typically not expensive (if not free). 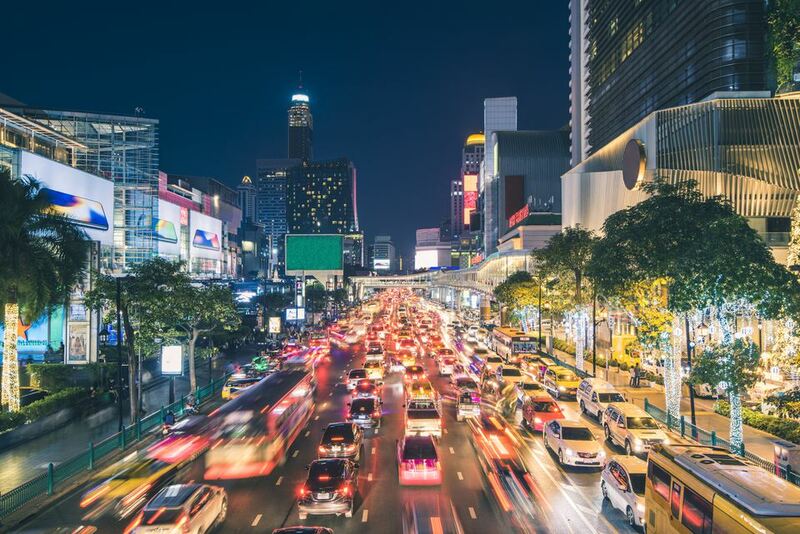 In very crowded areas—such as Siam Square in Bangkok—drivers are expected to leave their cars in neutral so that they can be pushed out of the way if necessary. Pristine bumpers are difficult to maintain under the circumstances. It is illegal to talk on the phone without a headset while driving in Thailand. People seem to break this law quite frequently, but if you do, you risk getting a ticket. If you get pulled over, hand your license and car rental documents to the officer. He or she may also ask for your passport. If you are ticketed, your license will be confiscated and you will be required to go in person to the nearest police station to settle your ticket fee and pick up your license.